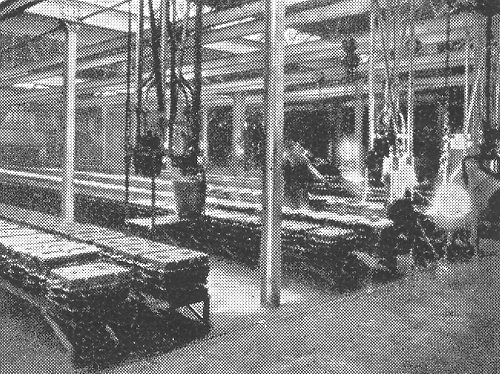 Vast numbers of iron castings were produced in the Black Country by the many foundries that were a familiar sight in the area. Cupola furnaces formed an important part of the local landscape, and Walsall had its fair share of them. By 1851 there were 25 foundries, many of which were producing items for the local buckle, saddle, bridle, and horse furniture industries, but by the later part of the 19th century the items were more diverse. In the 20th century the industry supplied castings to car, motorcycle, and bicycle manufacturers; to electrical engineering companies; to shipbuilders, and to industries of all kinds. Filling a ladle at Chamberlin plc. 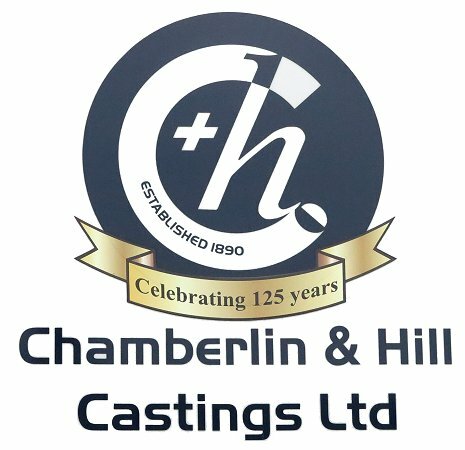 One of the longest surviving foundries in Walsall is Chamberlin & Hill, now Chamberlin plc, in Chuckery Road. The company was established in 1890, and like most of the local foundries must have produced a wide range of castings to order. The earliest known products are black money boxes. In 1920 the business was acquired by the Bather family, and in 1946 became a limited company. In recent times other foundries were acquired. The first, Russell Ductile Castings Limited of Scunthorpe was acquired in 1999, and the second, Chamberlin & Hill Castings Limited of Leicester was acquired in 2004. In 2005 the Bather family sold their share in the company, which changed its name to Chamberlin plc in 2007. The Walsall foundry produces precision castings up to 5kg in grey iron, to an extremely high specification, many for German car manufacturers. The business is very successful and has recently had a record year. H. Goodwin (Castings) Limited of Stafford Street, founded by Mr. Goodwin in 1919. The malleable and grey iron foundry produces engineering castings in malleable, ductile, aluminium and grey iron for a wide range of industries. The foundry has two 350kg and one 200kg Inductatherm medium frequency induction melting furnaces, and offers pattern design, and prototype manufacturing facilities. Another foundry is Lowe Brass, based in Clarendon Street, Bloxwich. The firm was established in 1965 and produces brass name plates, rally plaques, vintage car plaques, canal and boat makers plaques, horse brasses, paper weights, door knockers etc. A relatively recent company is Majorfax Limited, in Charles Street. It was established in 1984 and supplies castings in grey and ductile iron, carbon and stainless steel, aluminium, and brass. Another foundry is J. W. Bonser (Walsall) Limited in Albert Street. The firm manufactures high pressure zinc die-castings, and has comprehensive machining, finishing, polishing, chrome plating, gold plating and powder coating facilities. Finished products include bathroom fittings. Castings Limited in Selborne Street, Walsall were a long-established business, which opened around 1850. The firm produced high quality castings in whiteheart and blackheart malleable iron. Customers included car manufacturers, motorcycle manufacturers, trailer manufacturers, agricultural machinery manufacturers, and general engineering companies. 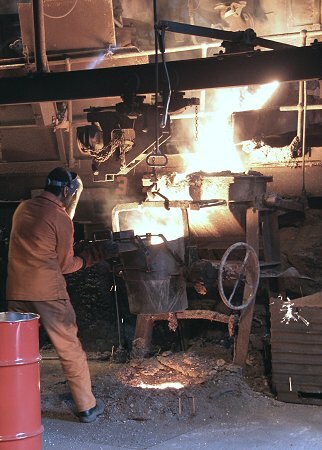 The firm also produced iron castings with special properties such as high strength and good shock resistance that were suitable for flame hardening or arc welding. 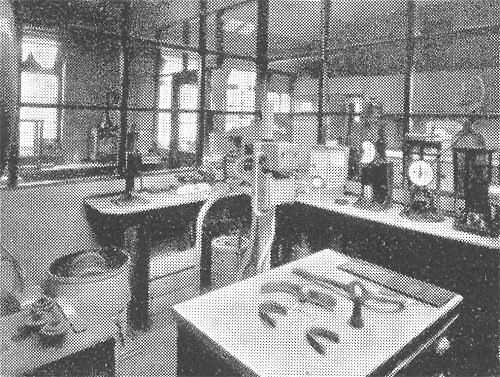 A corner of the laboratory at Castings Limited. A corner of Castings Limited's foundry. The firm specialised in the latest types of annealing to ensure consistent physical properties of castings. During the process the temperature was controlled by a continuous temperature recorder, and test samples were examined under a microscope. All raw materials had to meet an exacting specification, and were checked in the laboratory. 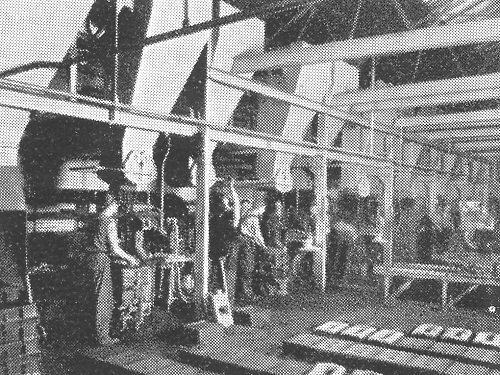 The latest rotary furnaces were used to produce the iron. 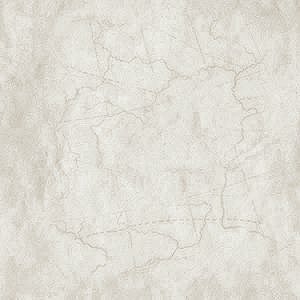 which was cast in power moulding machines. After annealing, the castings were shot-blasted using airless centrifugal machines, so that they were absolutely free from sand, and suitable for enamelling. The Selborne Street factory is now occupied by Presco Components Limited. Another view of Castings Limited's foundry. 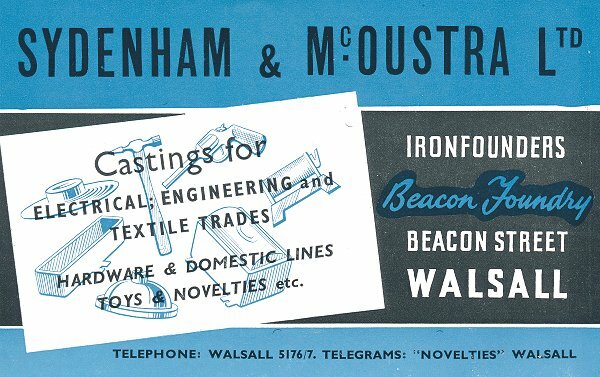 Another well-known Walsall ironfounder was Sydenham & McOustra Limited which started at Beacon Foundry, Beacon Street, Walsall in about 1900. The firm specialised in light castings for electrical engineering companies, and the textile trade. The foundry was slightly unusual in that as well as producing a range of castings for its customers, it also produced a range of finished goods including small carpenter's tools, adhesive and tape dispensers, toys, and money boxes. The up-to-date factory included a rest room, and shower baths for the employees. Many of the non-ferrous foundries in the town produced horse furniture, particularly after the introduction of nickel casting. They supplied the local bit makers, stirrup makers, harness furniture makers, and horse brass makers. An advert from 1953. Pigot’s Staffordshire Directory of 1842 lists 23 brass foundries, and 16 brass and iron casters, many supplying the 41 stirrup makers, 22 spur makers, 5 spur rowel makers, and 122 bridle bit makers that were in the town at the time. By 1935 (Walsall Red Book and Directory) the numbers had reduced. There were 18 brass and nickel silver foundries, and 11 bridle bit makers, 11 stirrup makers, 10 spur makers, and 1 spur rowel maker. Some of the horse furniture makers diversified into other areas, eventually abandoning horse-based products. Joseph Withers & Sons Limited originally made harnesses, but in the 1930s began to produce non-ferrous castings and fittings for holloware, bathrooms, and cars. J. & J. Wiggin Limited began making bridle bits in Bloxwich, and later turned to stainless steel tableware.